With just over a month until "X-Men: Days of Future Past" arrives in theaters, 20th Century Fox is offering one last preview. The studio has unleashed a third and final trailer for the follow-up to "X-Men: First Class," and enlists Hugh Jackman's Wolverine to help explain the time-bending plot. "Days of Future past" sees the X-Men joining forces with the prior generation in order to save them all from a war that seeks to eliminate everyone, mutants included. The first time you heard that set-up, you probably had a reaction similar to James McAvoy's young Charles Xavier: "Can you give me that one more time, please?" And so Hugh Jackman's Wolverine breaks it down: "In the beginning, the sentinels were just targeting mutants. And then they began targeting everyone. I've come a long way to guide us, to bring us together," he tells the skeptical Xavier, adding, "The person who sent me was you." 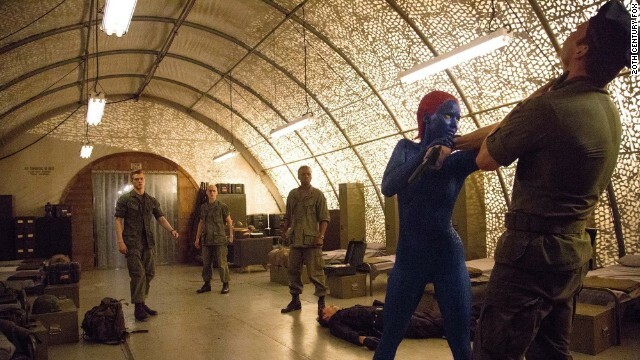 With its dual timelines "Days of Future Past" manages to involve two sets of X-Men at the same time. There's Jennifer Lawrence's Mystique and Nicholas Hoult's Beast, Halle Berry's Storm and Ellen Page's Shadowcat, and two Magnetos: Ian McKellen's older version, and the younger one played by Michael Fassbender. Directed by Bryan Singer, "X-Men: Days of Future Past" arrives on May 23.